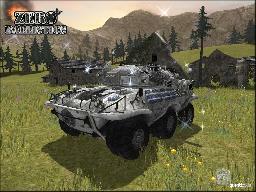 The player controls one of two available tank models, each in one way or the other based on existing, contemporary tanks or LAVs (Light Armored Vehicles). The tanks are incredibly detailed and offer as much as 81 different equipment combinations. Tired of a common class systems we give the player the freedom to choose the exact weapon/skill combination he or she desires, every time while waiting for the next respawn. There are three different main- and three different secondary weapons, ranging from the powerful splash cannon to the devastating flame thrower. On top of this there are two different skill sets, surprisingly called first and second skill. 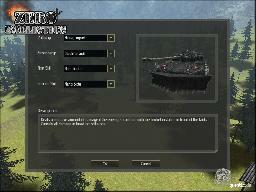 In the first skill category you can find things like a ram bucket or guided missiles, while the second category offers defensive skills such as shield generator or nanobots, which can quickly repair a severely damaged tank. To add a little bit more to the awesomeness of our game, the player earns so called 'upgrade points' with each kill or kill assist. These upgrade points can be spent on three different upgrade trees: weapon, armor and speed, increasing the respective amount of damage, hitpoints or, ahem, speed. 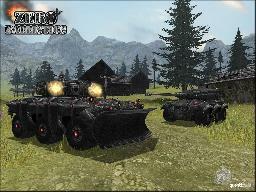 The different weapons, skills and upgrade levels are of course directly visible on the tank model.